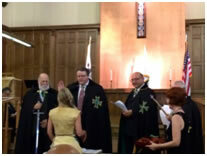 On the 13th of September 2014, the Grand Priory of the United States of the Hospitaller Order of Saint Lazarus of Jerusalem organised its fourth national investiture, this being the first time that it was organised in the First Congregational Church of Riverside in California. 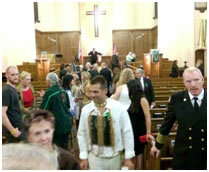 The majestic and immense church was indeed welcoming to all the officers, members, postulants and guests who came to the investiture. 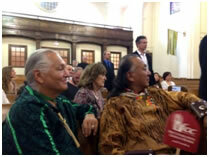 Twelve different commanderies from the various US states were represented, apart from an extensive amount of members from the Priory of Indigenous People led by Pastor James 'Flaming Eagle' Mooney. 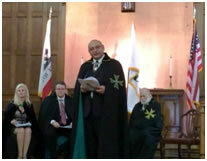 Officers from Humanity Healing International and from the Sacred Medical Order of the Knights of Hope, both international organisations who are fully affiliated with the United Grand Priories of the Hospitaller Order of Saint Lazarus of Jerusalem, were present for the investiture. 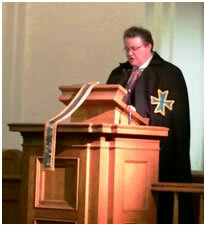 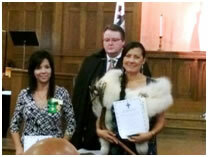 The ceremony and investiture was led by the Grand Chancellor of the Order, Chev. 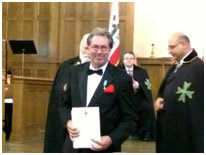 Max J Ellul GCLJ GCMLJ, who was ably assisted by the Chancellor of the US Grand Priory, the Chev. 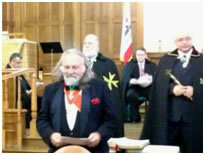 Christopher Chambers of Skighaugh and the Secretary General of the US Grand Priory Dame Karen Cantrell and the Grand Commander of the US Grand Priory, the Chevalier Eliezer Ben Joseph. 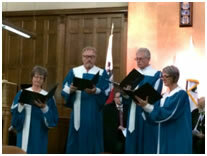 As is the norm all over the jurisdictions of the Order world-wide, the list of postulants who were admitted into the Order in this investiture was yet again plentiful not only in quantity but most specifically in quality. 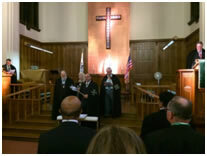 Philanthropists, active humanitarians, military personnel and established business executives and scientists were inducted into the Order; a total of 36 members where invested with their new rank within the Grand Priory of the United States during this investiture in what was referred to as 'a very moving, spiritual setting for the investiture'. 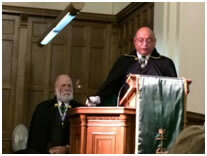 The Supreme Grand Priory congratulates the US Grand Priory for its zeal throughout the years, the latter ensuring that the Grand Priory in question reaches the top ranks of Grand Priories worldwide not only in size and number but also for its constant Hospitaller work in favour of the needy.